It's been one week since Sandy Hook, and people have responded in various ways. Candlelight vigils, monetary donations, music videos and montages, political discussions, days of silence, care packages. All acts impassioned, though different. On Tuesday, some bloggers, including me, participated in a blogger day of silence with information for donations that would go directly to the families of the Sandy Hook victims. When this "event" was announced by other Houston bloggers, I resisted participating, because quite honestly, I thought to myself, "What good will that do?" And then it dawned on me that I would never say that about a candlelight vigil or a moment of silence at a gathering or during someone's prayer or a bouquet of flowers for a mourning father. While these acts do not change firearms laws or help families off-set the costs of funeral services, they are acts of support and remembrance -- for those who are gone and those who are left behind. These acts are still important. it out into the world now. I think we can all agree that these mass shootings need to stop. your hands and say, "It's not about guns. There is evil everywhere." NOT GOOD ENOUGH. Send out all the love you can muster to everyone involved in the Sandy Hook shooting." Needless to say, I did a lot of talking. Mostly, I think this is a good reaction, because it's an issue that needs to be addressed seriously and quickly. But on Monday night, I had a sinking feeling knowing I hadn't done anything for those grieving families. (Cue flashback to my days of being a CASA.) In my jump to solve this problem of mass shootings (or in this case, a massacre), I brushed over the emotional aspect and skipped opportunities to help those families in a tangible way. I made a snap decision to participate. The blogger day of silence sparked a reaction that caught me off-guard, and I found myself explaining my "side" to Betsy and Gesci, two blogger friends who I almost always see eye-to-eye with and admire greatly. You can read my comment and Betsy's reply in her comment section for more detail. Clearly, I didn't observe a complete day of silence. Besty and Gesci are intelligent, realistic conversationalists, so I felt confident discussing it with them. In the end, I think we're all "right." Amidst all the praying and meditative silence, we need to identify ways to make this stop and start making changes. People respond in different ways and at different times. It is possible for a person to engage in solution-oriented (mostly political) discussion and observe a day/hour/moment of silence. One need not choose. Those who do respond with prayer, vigils, moments of silence, and music videos (<-- My sis and BIL sang with this girl in high school.) are not wasting their time. Those actions are not the same as giving up and assuming it will happen again. It's important to let people respond differently as long as we discuss solutions to eliminate these situations. As I said last Friday, get in the conversation. We need solutions now. And as you head off into your weekend of holiday celebrations, remember how fortunate you are and know how much you have to give to others with just a hug or a handwritten note. Start loving your loved ones (and strangers) a little deeper. Preach. Or have a quiet moment- both are great, as long as neither are passive, which I know you would never become. You, my friend, have a powerful voice (yes, even in silence) and I am thankful to have heard it. Silence out of respect and reflection is not the same as complacency, and words can be as disregarding and hurtful as they can be uplifting and proactive. So thank you for being sure we are ALL headed to the same goals, no matter our route. what she said. I'm so honored to have talked with you about this - thank for for helping me be more aware. OH, my heart breaks for this school, and this country. 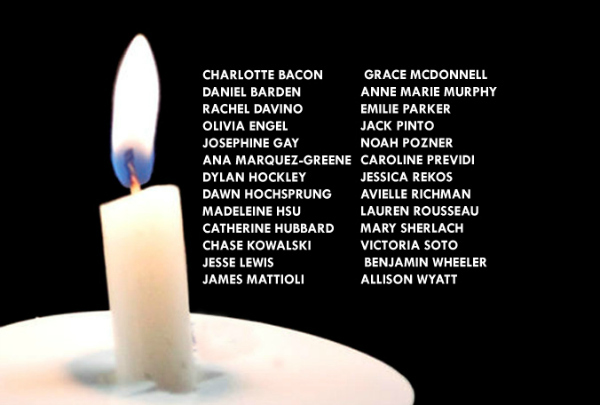 December 24, there's an event going on -- At 6pm that night light a candle in honor of them.